10 Minutes in the life and mind of Daryl might just change you forever. 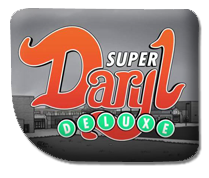 Today we're Diving In to 10 minute of Super Daryl Deluxe from Dan and Gary Games, releasing on the 10th April for Nintendo Switch. A strange kid, a robotic vice-principal, a princess and a surreal obsession with textbooks are just a few of the eccentricities to greet you in the new 2D Action-RPG, that looks on being a runaway success and definitely one not to miss for fans of the genre. All our videos can be found on our YouTube Channel .